Music Library N1 is the world's first audiophile grade source component. N1 is not just a simple NAS for PC or transport, but manage all music files'access, store, deliver and play with high quality hardware and software. ​Melco N1 and N1/2 are audiophile grade source components to access, store and deliver Hi-Res Digital Music without any of the compromises of computers and their peripherals. They are both music store and UPnP server for Ethernet connected streaming solutions, and are also a source for a USB connected DAC. When connected to an USB-DAC, the internal player can be controlled directly from the front panel as well as by network App. 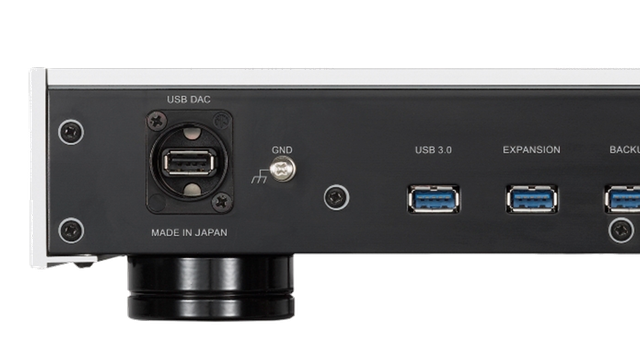 The USB-DAC player supports DSD as both DoP and as Markerless DSD (Not DoP). There is no need for a PC in order to setup or manage the system and there is no data switch or IT device in the signal path to come between you and your music. automatically download any pending music purchases and will also apply CRC check to ensure no data corruption. - No need for a download computer with risk of data corruption and need to then move the music from the PC to the Melco. - Download High-Res Music and qobuz direct to Melco Digital Music Library. Melco will import or play music from a USB connected optical drive. Optical drive is automatically recognised - no setup or configuration. ​- CD-DA/CD Extra/Mixed-Mode CD are supported. - Imported CD is automatically placed into import_CD folder for easy music management. - Menu items allows for setting of CD loader offsets for bit perfect import. Other Drives may work with N1. Please check with your dealer. 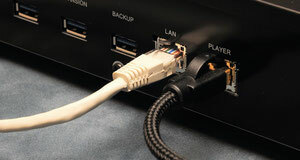 ​Unlike PC based systems, Melco has a dedicated PLAYER port. This allows connection directly to the network Streamer or Player without any data switch in the signal path which would damage the music data. on the Network as soon as a DAC is connected to the N1. - The N1 Local USB-DAC Player supports PCM up to 384 kHz / 32 bit, and DSD up to 11.3 MHz Quad DSD. a 96 kHz capable DAC. - The Melco Local USB-DAC player can be easily controlled by your favorite UPnP control Point (App). stored on the App (Mode 0) when the App requires it. - The Melco Local USB-DAC player will play Music stored on open shares on the Network in addition to music stored on the Melco. - Melco Direct Local Play - browse and play music directly from the front panel without any requirement for an App or Ethernet connection. Support Repeat and Shuffle playback. - CD transport - A CD loaded into the optical drive offers choice to IMPORT or PLAY. Selecting PLAY - the N1 functions as a high-end CD player allowing use of the latest USB-DAC technology with control from the front panel and informative display on the front panel OELD. Support Repeat and Shuffle playback. - MELCO Markerless DSD Playback (Not DoP) - DSD file is played without PCM marking if the connected USB-DAC supports Markerless DSD playback. Check the compatible USB-DAC. "DSD over PCM priority mode" applies DoP playback even if a connected USB-DAC supports Markerless DSD playback. Additionally, "Legacy" mode will work as previous firmware Ver 3.00-3.21 Local USB-DAC Player. *The available streaming service will vary depending on country. ​ - No PC required for setup and installation - no specialist knowledge needed. - Pre-installed media server - no configuration required. - Supports multiple specialised media servers - currently shipping with Twonky 7 with DSD support. - Informative OLED front panel display - displays current streaming track data, system status, and setup. - Simple menu navigation structure and track selection.